On a clear day, Whiteface Mountain and Mount Marcy are visible on the horizon. Enjoy the incredibly beautiful view of the historic Fulton Chain of Lakes as it stretches to the east with the line of High Peaks rising beyond. 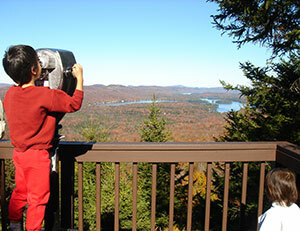 On a clear day, Whiteface Mountain and Mount Marcy are visible on the horizon. Gray Lake lies to the north between McCauley Mountain and the village of Old Forge. 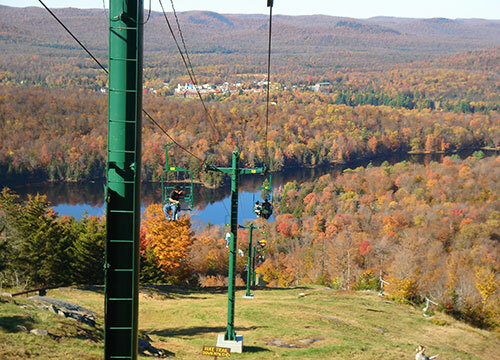 Riding the chair lift allows you and your family to view the mountain scenery, magnificent foliage and gorgeous views without the trouble of hiking to find the best location. During the fall you can witness nature's amazing show as the colors of the Adirondacks change. Pack a lunch for a picnic at the top and watch the deer as they wander in and out of the trees. Enjoy the tranquil beauty that is distinctly found in the center of the Adirondack Mountains. Open late June through Sunday, October 14th. Open FRIDAY - SUNDAY until October 14th.